LONDON (AP) — The European Union marked 100 days until Brexit on Wednesday by triggering an action plan to ensure planes can still fly and money can still flow between Britain and the bloc in the increasingly likely event that the U.K. leaves the EU without a divorce deal. The British government, struggling to break a political logjam over Brexit, released immigration plans that it said will “take back control” of the country’s borders — but which opponents warn will batter the economy by shutting out everyone but highly paid professionals. The EU measures, announced a day after Britain ramped up its own no-deal planning, are intended to alleviate “major disruption” to people and businesses in case squabbling U.K. politicians fail to ratify a withdrawal agreement between Britain and the bloc. 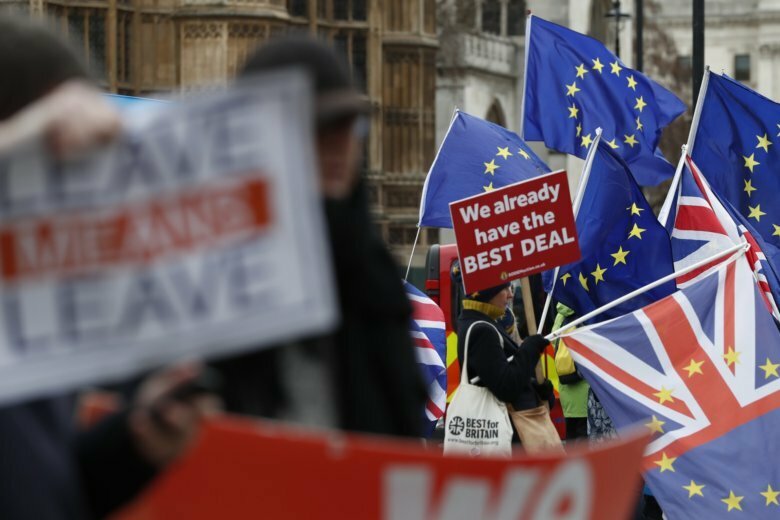 Britain is due to leave the EU on March 29, but it’s unclear whether lawmakers will approve the divorce agreement Prime Minister Theresa May’s government has negotiated with the bloc. May postponed a vote in Parliament last week because the deal faced heavy defeat. It has been rescheduled for mid-January, but opposition remains strong across the political spectrum. Leaving without a deal risks plunging the British economy into recession and sparking chaos at the borders, as four decades of economic alignment and open markets evaporate. The EU plan includes temporary one- to two-year measures to allow some U.K.-EU financial services to continue and a 12-month provision to keep planes flying between Britain and the bloc. Britain’s no-deal preparations include putting 3,500 soldiers on standby, chartering boats to bring in goods and stockpiling medicines. The government called them sensible precautions, but opposition politicians accused May of trying to scare lawmakers into supporting her Brexit deal. “No-deal would be a disaster for our country and no responsible government would ever allow it,” Labour Party leader Jeremy Corbyn said. Most members of Parliament dislike both May’s Brexit deal and the prospect of leaving the EU without an agreement, but they are deeply divided about what to do instead, and the country’s political debate has grown increasingly bad-tempered as Brexit day approaches. Corbyn was forced to deny calling May a “stupid woman” in the House of Commons on Wednesday, after he was caught appearing to mutter the insult during a fiery debate. “I did not use the words ‘stupid woman’ about the prime minister or anyone else, and am completely opposed to the use of sexist or misogynist language in absolutely any form at all,” Corbyn said. In a bid to regain some of its vanished political momentum, the British government published long-awaited plans for a post-Brexit immigration system that will end the automatic right of EU citizens to live in the U.K. The government proposal places no limit on the number of well-paid, skilled immigrants who can settle in Britain, but puts curbs on “low-skilled” workers, who would only be able to get one-year working visas. The government plan suggests setting a salary threshold that immigrants will have to meet in order to be given the right to settle in Britain. An independent body advising the government has suggested 30,000 pounds ($38,000) a year — above the median U.K. wage and more than the starting salary for nurses, paramedics, junior doctors and many other professions. Saffron Cordery, deputy chief executive of NHS Providers — an umbrella group for Britain’s state-funded health care system — said the health sector was “deeply concerned” about the proposal. The government said the exact salary threshold would be decided after public consultation. The rules will not apply to more than 3 million EU citizens currently living in Britain. The government has said they can stay, even if the U.K. leaves the bloc without an agreement on future relations. The EU, in its no-deal plans, urged member states to extend the same right to more than 1 million resident British nationals. Immigration was a major factor behind Britain’s 2016 vote to leave the EU, and May has made ending free movement and cutting net immigration by more than half to below 100,000 people a year her key Brexit goals. But that has put her at odds with many business leaders. Big chunks of Britain’s economy, from agriculture to health care, have come to depend on European workers, more than 1 million of whom have moved to Britain in the last 15 years. Businesses fear that choking off the flow of lower-skilled workers could lead to acute employee shortages. “It’s beyond me that any U.K. prime minister would want to have as her legacy turning the U.K. inwards and making it less open and welcoming to people from the rest of the world,” Sturgeon said. The longer the political impasse drags on, the more worried British businesses get. The country’s five leading business groups said in a rare joint statement that businesses “have been watching in horror” as the prospect of a disorderly Brexit grew more likely. Cook reported from Brussels. Associated Press writer Danica Kirka in London contributed to this report.